Egg: Minute, globular, almost transparent, can have reddish tinge. Immatures: Similar to two-spotted mite. Adult: Approximately 0.5 mm long with 8 legs, uniformly dark red, distinguishing it from two-spotted mite which is yellowish-green with two dark spots. 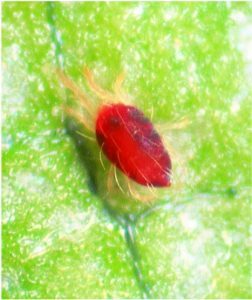 In cooler climates the red overwintering phase of two-spotted mite is a lighter red than that of bean spider mite. Damage: Feeds on underside of leaf and sometimes on upper surface. Leaves become mottled and bleached. Severe infestations can cause premature leaf fall. Damaging populations develop quickly in warm, dry conditions. « Tree Stock project results in revised standard	» 2019 Tree Stock Roadshow coming to a capital city near you!